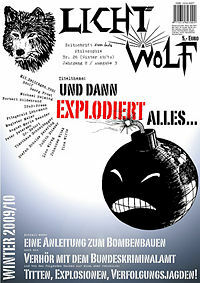 Lichtwolf - ZineWiki - the history and culture of zines, independent media and the small press. Lichtwolf – Zeitschrift trotz Philosophie (german for "journal despite philosophy") is a quarterly zine founded 2002 in Freiburg, Germany. It features essays, short stories and poems concerning philosophical questions, most of which are handled in a youthful colloquial tone. For the first six years every issue was written on a typewriter and illustrated mainly with drawings. The first 12 issues consisted of stapled papers, from 2004 on Lichtwolf issues were published as xeroxed booklets. Since 2008 the magazine is composed entirely with the open-source DTP program Scribus while preserving the traditional "typewriter, pen and scissors" layout. The zine relocated to northern Germany in 2009 and is since then being published by a small publishing house. Lichtwolf issues are distributed exclusively via internet mailorder. Every issue is published at the beginning of a new season. Contributions deal with a certain theme or motto like forgetting, misanthropy, advertising or work, taking a more and more philosophical stance at them. Each issue also covers political events or those within the literary and philosophical scene of Germany, often in an ironical way. Issue 46 was published February 2014. In addition to the regular issues there are several specials like a small booklet portraying the life and work of Jorge Luis Borges. Frequent contributors are Michael Helming, Norbert Hildebrand, August Maria Neander and Timotheus Schneidegger. This page was last modified on 14 September 2014, at 05:47.